In 2009 and 2010 we should see a lot of hybrids and fully electric cars hitting the roads. I spent a little time this weekend reviewing the potential offerings. Here is where some of the more frequently-mentioned offerings stand. This is probably the most unusual offering. I first mentioned the Aptera in a story last year, and the roll-out is still on target for Q4 of this year. 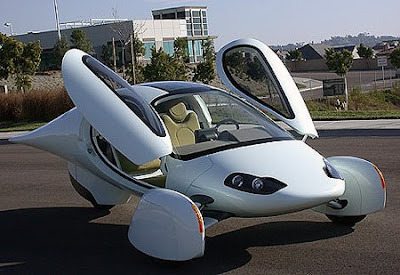 It is a 3-wheeled vehicle, made of light-weight composites. The shape is very aerodynamic to minimize wind resistance. The batteries recharge in 8 hours, and the car reportedly has a range of 100 miles. The cost is going to be in the range of $30,000, and the company reports that they already have deposits down for 4,000 vehicles. The business model looks sound; nearly 4000 deposits have been placed (Robin Williams among the clientele), enthusiastic investors are locked in, and co-founders Steve Fambro and Chris Anthony have assembled a team that balances Detroit low-volume niche-production experience with California “anything is possible” attitude. Chief engineer Tom Reichenbach was formerly vehicle engineering manager for both Ford GT and Shelby GT500 programs; and CEO Paul Wilbur has a storied history at Ford, Chrysler and ASC. And Fambro, a biotech engineer and private pilot intrigued by his aircraft’s composite construction, and Anthony, a composites specialist with a background in boat design and fluid dynamics, seemed predestined for this partnership. There’s a large hooded digital speedometer and bar-graph battery state-of-charge indicator, along with a central infotainment screen that offers mind-boggling possibilities. Leg- and head room were surprisingly generous for even my 6-foot-3 frame. And safety is preeminent in the Aptera’s design — the final version will have both frontal and side airbags. And if there was any doubt about the strength of the composite construction, it was quelled as eight Aptera employees stood on the roof of a development shell. And that was after the shell had gone through government roof-crush testing! The car will initially be available only in California, but I will be watching closely to see how well it sells. Will it be accepted by the public? I have given thought to how I would feel about driving one around. I think the police would pull you over a lot, thinking the car isn’t street legal. Regardless, I am certainly rooting for it to be a success. The 2010 Ford Fusion hybrid is the best gasoline-electric hybrid yet. What makes it best is a top-drawer blend of an already very good midsize sedan with the industry’s smoothest, best-integrated gas-electric power system. It’s so well-done that you have to look to the $107,000 Lexus LS 600h hybrid to come close. The Fusion Hybrid qualifies for a federal tax credit of $3,400 until the end of March, but few of the cars will reach dealerships by then – if you’re in the market, you might want to consider ordering yours before the credit disappears. If any Ford product has your eye, you should be aware that Ford is offering some of the deepest discounts we’ve seen in years this month. Ford has pulled off a game changer with this 2010 model, creating a high-mpg family hauler that’s fun to drive. That achievement has two components: First, the machinery is unexpectedly refined—call it Toyota slickness expressed with car-guy soul. Second, the electronic instrument cluster involves the driver, invites you into the hybrid game, and gives you the feedback needed to keep increasing your personal-best mpg number. I have to say this is quite an exciting development. I am now in my 12th month without a car, but it may be time to go ahead and purchase one. Given that I could get the tax credit if I order by the end of March, I may go ahead and pull the trigger. The Extended-Range Electric Vehicle that is redefining the automotive world is no longer just a rumor. In fact, its propulsion system is so revolutionary, it’s unlike any other vehicle or electric car that’s ever been introduced. And we’re making this remarkable vision a reality, so that one day you’ll have the freedom to drive gas-free. So it isn’t a purely electric car, but does have a pretty good battery range for a full-sized car. Plus, there are apparently provisions in the auto bailout that make the Volt eligible for a $7,500 tax credit. 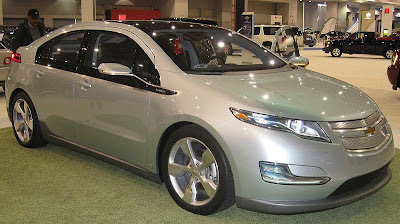 But there are certainly skeptics that the Volt will ever live up to the hype. Speaking of hype, the all-electric Tesla Roadster reminds me of some of the more exotic and overhyped biofuels. We have heard about it forever, but the costs keep going up and the roll-out date for mass production keeps getting pushed out. The price is now up to $109,000, and even though performance reports of the handful that have been built are very impressive, there are serious questions as to whether this experiment will ultimately be successful. Based on a Lotus platform, and assembled at the Lotus factory in Hethel, England, the Tesla has been mired in controversy throughout its short history. The latest setback was that Tesla lost a legal ruling to up and coming competitor Fisker Automotive, themselves creating a worthy competitor to the Roadster in the Fisker Karma. The Karma is an extended range hybrid that can go 50 miles before the gasoline engine has to kick in. (The Karma is expected to hit the road in 2010). By all accounts Tesla is building a car with impressive specifications, and they plan to follow the Roadster up with the Tesla Model S that will be quite a bit cheaper than the Roadster. But Tesla has had cash flow problems and has been forced to lay off people. From the various accounts I have read, I don’t expect the Tesla to be in the race in the long run. One website got so tired of the hype that they turned their ‘Tesla birth watch’ into a ‘Tesla death watch.’ Still, I think the company is to be commended for their innovation, and I hope they get the problems worked out. (On an amusing personal note, former CEO Martin Eberhard has reportedly read this blog, and got a kick out of my tangles with Vinod Khosla). I wanted to limit this list to 5 cars, and there were a number of contenders worth a mention. But I would be remiss not to include the next generation Prius among the list of offerings. While at least one private company has already been modifying the Prius to be a plug-in hybrid, Toyota is working furiously to be the first to put large numbers of plug-in hybrids on U.S. roads. Initially announced for 2010, Toyota has moved up the schedule for the plug-in Prius and plans to have the first 500 on the road by the end of 2009 (150 in the U.S.). The downside is that the first prototypes can only go about 7 miles on battery power alone, which is well-short of the average person’s commute. So you can expect the plug-in Prius to run on gasoline most of the time. There are a number of other electric offerings worth a mention. Nissan has announced plans to put electric cars on U.S. roads by 2010. BMW has begun producing all-electric versions of their popular Mini Cooper, and so far can’t keep up with demand. ZAP is putting a sporty 3-wheeled electric car out (the Alias), along with offerings such as an electric truck and sedan. The Alias can reportedly go 100 miles on a charge. Finally, Toronto-based Zenn Motor Company says they will put an electric car on the roads in 2009. This one is particularly noteworthy because of their intention to use EEStor’s ultracapacitor to power the vehicle. EEStor claims that their ultracapacitor is 1/10th the weight and volume of conventional battery technology. While potentially a game-changer, many feel that EEStor is a classic case of vaporware, and many capacitor experts say that it will never see the light of day. In response, Zenn says that their electric vehicles are not contingent upon the success of the ultracapacitor. And in fact, according to their website I can buy an all-electric Zenn vehicle here in the Dallas area right now. There are two dealers to choose from in the Dallas-Fort Worth area, and one of the dealers claims a 260 mile range on a single charge. I think I will try to make a trip down to see if they really have something in stock. Based on the large number of electric offerings to be rolled out over the next two years, I would be surprised if some don’t stick around for the long run. A return to $4.00 gasoline should accelerate public acceptance of electric vehicles. The Aptera looks like a winner, provided buyers embrace the futuristic design. The Ford Fusion hybrid also looks like it is ready to make major inroads into the market share of the Toyota Prius. And don’t be surprised to see lots of electric Mini Coopers showing up on the roads soon. Now I just need to figure out if I am ready to be a part of the experiment and buy one of these vehicles.